The City Sewers is full of trash. Most of the Maradan citizens living in the City throw their rubbish on the groud which ultimately ends up here in the Sewers. 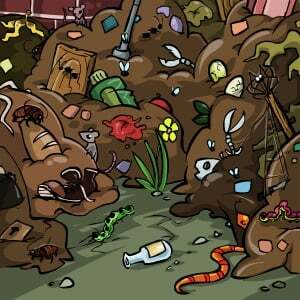 The smell is awful and this Trash Heap is full of bugs and diseases. You can only visit once every 48 hours to avoid the deadly plague. See what you can grab for FREE! Buy a Trash Heap Giftbox item and you can use the trash heap twice as often for life!